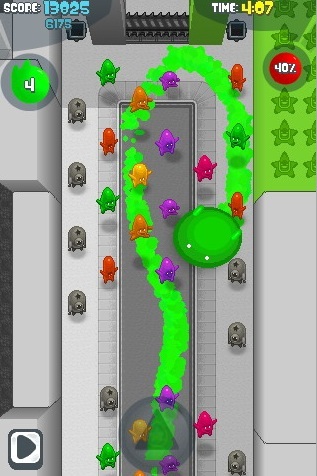 Paint the town red (and green and blue and yellow) with THQ's slow moving and boring Blob game. Nestled between THQ's biggest franchises (namely WWE and Pixar) is de Blob, an imaginative platform adventure game that encourages us to splash paint on everything. It's one of the Wii's most anticipated games, so we were ecstatic to see a version come to iPhone. Then we played it and realized it's not nearly as much fun as its big brother. De Blob casts you as a colorless blob of goo that has the ability to absorb paint and then splash color on anything it touches. It uses this cool feature to save the city of Chroma, a place taken over by the evil I.N.K.T. corporation. These guys stripped the city of its color, and it's up to de Blob to stomp the bad buys while literally painting the town red. Unlike the Wii version, de Blob for iPhone is a top down game, though while the perspective changed, the goal remains the same: to slide around and rescue the city's inhabitants from I.N.K.T. while re-painting all of the buildings. It's a neat premise that didn't translate to Apple's device because of the awkward controls. De Blob comes with two control schemes, both of which make the game annoying. Like most iPhone games, it allows you to control the character by tilting the phone, but it just doesn't work as well as we'd like. De Blob is slow moving, and in order for him to gain speed, we need to tilt the phone too much. It's also a pain navigating around buildings, since de Blob often gets stuck on corners. In addition to the accelerometer controls, the game allows you to control the action with your finger, so if you want de Blob to go right, just slide your finger in that direction. It works better, but we never felt like we had complete control. On top of that, not all of the missions held our interest. Racing is a pain because of the controls and destroying bad guys is awkward because the game doesn't show a map of enemies and you'll randomly run into them, forcing you to find a fountain to wash off the resulting black color that prevents you from painting anything. It's a shame, because we love de Blob's concept, but the controls are too frustrating. We occasionally play it just to mix colors and paint buildings because that's cool, but in terms of completing missions, we just don't have the patience. What's Hot: Looks good, painting things different colors is cool, likeable blob. What's Not: Moves to slowly, tilt controls aren't very responsive, missions get old quick.